Talk about an egregious failure to warn the public. It makes you wonder if Big Pharma will EVER learn it’s lesson. On November 10, 1994 the CEO of Johnson & Johnson received a letter from The Cancer Prevention Coalition to document that a Harvard medical school researcher had published the link between talcum powder and ovarian cancer and begged the CEO to make women aware of the risks of using baby powder on their girl parts. The folks over at CPC thought it was a really big deal to alert someone at J&J that there was now undeniable clinical proof that talcum powder caused cancer, since Johnson’s Baby Powder is comprised practically 100% of talc, the stuff they make talcum powder out of. Talcum powder, of course, with the exception of some fragrance, is the sole ingredient in baby powder. You know, that white, powdery, moisture-wicking stuff that people have been throwing on baby butts, and their own nether regions – practically forever. To add insult to injury, it is a fact that in naturally occurring talc deposits, there are also varying levels of naturally occurring asbestos. That’s right, asbestos. Of course, asbestos has been getting a bad rap since the 1970’s when it was clinically proven to be responsible for giving people a veritable plethora of lung and respiratory ailments, in addition to mesothelioma. Mesothelioma is a particularly unpleasant form of lung cancer – which kills you. Of course, armed with this new and devastating information, we know that the CEO of Johnson & Johnson immediately sprang into action and did the honorable, respectful and responsible thing and ordered an immediate recall, or at least a halt in sales, or maybe a change in the formulation or at a very minimum, maybe a prominent warning on the label to at least give people a heads-up about the link between talcum powder and ovarian cancer, right? Wrong! Instead, in what has now become an all-too-common recurrence of Big Pharma and their profits-before-people money-grabbing, they simply kept quiet and continued to knowingly market billions and billions of dollars’ worth of their product to several generations of unsuspecting consumers for another twenty two years and never made a single effort to warn consumers about the risk of developing ovarian cancer. The label on a bottle of Johnson’s Baby Powder on 11/26/2016. As you can see, after 22 years there is still no label warning about the connection between baby powder and ovarian cancer. After 22 years you’d think they’d change. But you’d be wrong. 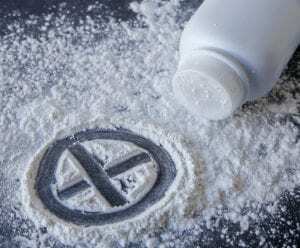 It’s now almost December 2016, and if you go to the store right now, you’ll see that there are STILL no cancer warnings on the label of J&J Baby Powder; just ingredients – talc and fragrance. Currently more than 1,700 ovarian cancer-related lawsuits have been filed in state and federal court and many do not have a talcum powder lawsuit loan, J&J just lost it’s 3rd baby powder trial on October 27, 2016 bringing the total to $197 million in verdicts so far and it looks like baby powder is shaping up to be the next big pharmaceutical multi-district litigation. Update, Johnson & Johnson in July was ordered to $4.7bn in damages to 22 women that claimed the company’s talcum powder contributed to them developing ovarian cancer. Contact us today by calling 434-535-5229 to get the talcum powder lawsuit loan that you need! We can help you.